Emanuel Kanal, MD, is one of the nation’s leading authorities on MR safety. He serves as a consultant on MR safety and MR contrast agent usage and safety for the FDA and chairs the American College of Radiology’s (ACR) Blue Ribbon Panel on MR Safety. He is a professor of radiology and neuroradiology and director of MR services at the University of Pittsburgh Medical Center. Kanal spoke with Radiology Today about the association between gadolinium-based contrast agents and nephrogenic systemic fibrosis (NSF), a rare but potentially fatal disease for which there is no known treatment. Radiology Today (RT): How would you summarize the concern about gadolinium-based contrast agents, which have been on the market since 1988, to enhance the quality of MR images and MR angiography? Emanuel Kanal, MD: Over the last two years, there have been some pretty strong associations made between the administration of gadolinium-based MR contrast agents and the subsequent development of a rather rare, debilitating, and potentially fatal disease, NSF. This is the case only in patients with severe or, especially, end-stage renal disease or those with acute kidney injury. Since 2007, the FDA has asked manufacturers to include a boxed warning on the product labeling of all gadolinium-based MR contrast agents, of which there are five: Magnevist (Bayer Schering Pharma), MultiHance (Bracco Diagnostics), Omniscan (GE Healthcare), OptiMARK (Mallinckrodt) and ProHance (also Bracco Diagnostics). What causes some renal patients to develop this potentially serious reaction, which can occur in as little as two days or as long as 18 months after the administration of the contrast agents? Kanal: There are theories that suggest that this may be related to something referred to as transmetallation. In brief, the gadolinium ion itself is a relatively powerful toxin. As such, the gadolinium is bonded, or chelated, together with a ligand molecule to make it safer, and it is administered to humans in that safer, chelated form. After the gadolinium is administered to the patient, it gets eliminated by the kidneys. If a patient does not have normal renal function, however, the gadolinium chelate will remain within that patient’s body for a much longer time. The theory—and it’s only a theory at this point—is that if it does remain for much longer than anticipated within the body of that patient, it gives the gadolinium ion the opportunity to dissociate from its ligand molecule, thus releasing the gadolinium ion. This is referred to as a transmetallation, or dechelation, process. The gadolinium ion’s release from its chelate might be associated with the effects that are tied to the subsequent development of NSF. Some people even use the term gadolinium toxicity or gadolinium intoxication, although I don’t personally know that we have any data that shows that this label accurately reflects that which is taking place in the NSF patient. RT: How many people have been affected by NSF? Kanal: In the entire world today, there probably have been fewer than 500 biopsy-proven cases. Shawn E. Cowper, MD, an associate professor of dermatopathology and pathology at Yale University who first described the disease back in 2000, has a database with around 300 patients for whom a diagnosis of NSF has been accepted. The number of MR studies in the world performed last year alone was 20 million or more, and contrast-enhanced studies probably account for 30% or so of these. This 500 number that I quoted who have the disease, that’s the total, cumulative number of patients with the disease in the nearly one decade since it was first identified. Therefore, as you can see, it is a very, very tiny percentage of all patients who receive a gadolinium-based MR contrast agent who end up being diagnosed with NSF. This percentage increases very significantly, however, if the recipient is a patient with end-stage renal disease, up to perhaps 2% to 7% of these patients. RT: When was the possible connection between gadolinium-based contrast agents and NSF first made? Kanal: In January 2006, Thomas Grobner, MD, of the department of nephrology at the General Hospital of Wiener Neustadt in Austria first reported an association of gadolinium agents having been administered to MR patients with renal disease who were subsequently found to have NSF. RT: What population of patients is most susceptible to NSF? Kanal: The original literature says patients with moderate, severe, or end-stage chronic kidney disease (CKD), which means patients in stages 3, 4, and 5 are the most susceptible. Ali Abu-Alfa, MD, FASN, of Yale University, has done his own review, and he has informed me that he believes the number of people with NSF with chronic severe kidney disease may have been reported incorrectly and may have included populations with acute kidney injury. In reality, it appears, the percentage of patients who have NSF with chronic end-stage kidney disease (ie, stage 5 CKD) seems to be in the mid to high 90s. A very small percentage, maybe single digit, has stage 4 CKD. A surprising number of all patients with NSF, perhaps one in eight, has acute kidney injury at the time of gadolinium administration. That is a bit more disconcerting because the way we screen patients today is with a single blood test (glomerular filtration rate [GFR]), which may not reliably pick up an acute kidney injury. RT: Since May 2007, the FDA has requested that a “black box” warning be placed on all five agents, while the number of NSF cases associated with the agents is not equally distributed among them. Do you believe that all five agents should be treated equally? Kanal: NSF has been reported to be associated with all five gadolinium-based agents available in the U.S. market today. The FDA refers to these reports as being confounded or nonconfounded. Say a patient gets Drug A and no records of having Drug B, C, D, or E and then has NSF reported. The FDA would consider that an isolated or nonconfounded case of NSF after having received an administration of Drug A only. But say that a patient received Drug A as well as Drug C and subsequently was diagnosed with NSF. The FDA would call that a confounded case. It’s still associated with prior gadolinium-based MR contrast administration, but we’re not sure whether it was associated with Drug A or C or both. There are no nonconfounded cases to date reported with MultiHance. There is one reported nonconfounded case (in Switzerland, I believe) for ProHance, and that one is still being verified. There are several isolated, nonconfounded cases of NSF associated with the prior administration of OptiMARK, and, relatively speaking, quite a few for Ominscan and Magnevist. Is the FDA being fair when it treats all the agents equally? That’s a matter of opinion. The wording of the FDA’s black box warning, which was applied equally to all five agents, seems to suggest relative equality in the risks associated with the development of NSF following the administration of any of the FDA-approved gadolinium-based MR contrast agents. Others, myself included, believe that [equal treatment] is not doing this population of renal disease patients a service and that it may indeed be somewhat misleading. There is a rather sizable body of evidence, whether circumstantial or somewhat stronger than circumstantial, that the risk of developing NSF may not be the same following administration of these five gadolinium-based MR contrast agents available in the U.S. today. In fact in January 2008, we [Kanal; Dale R. Broome, MD; Diego R. Martin, MD, PhD; and Henrik S. Thomsen, MD] published in Radiology an editorial that was entitled, “Response to the FDA’s May 23, 2007, Nephrogenic Systemic Fibrosis Update.” In that editorial we specifically describe that we do not believe the relative risks in renally impaired patients should be assumed to be the same after each of these agents. We explain that there is a significant body of data that suggests that the relative risks of developing NSF may not be the same for each of these agents, and that we should be aware of that as we make our decisions clinically. I should also point out that GE has been kind enough to share with us that the number of new cases of NSF associated with Omniscan has plummeted since mid to late 2007 and, in fact, as of April 30, 2008, they have reported no new cases of Omniscan-associated NSF. Thus, whatever the industry is doing seems to be working. RT: So what is the industry doing? Kanal: Some people are saying if the patient has a GFR less than a certain cutoff (eg, less than 30 mL/min/1.73 m2), and the patient is a stage 4 or stage 5 CKD or acute kidney failure patient, they will not administer to these patients a gadolinium-based MR contrast agent—no gadolinium at all. I don’t personally subscribe to that methodology, as I believe that a risk/benefit assessment should be performed for every patient. There are certainly some physicians, including those at my own site, who do just that and customize patient care delivery to the patient at hand. Some of these who do administer gadolinium-based MR contrast agents if clinically indicated, even to patients with significant renal disease, if the risk/benefit assessment warrants doing so, administer as little of these agents as possible to these renal disease patients. Still others have changed which agent they will and will not use in renally impaired patients, or in some cases, in all patients. We don’t know what may have caused this decrease in Omniscan-associated NSF incidence of late, but whatever it is, at least the decrease in newly diagnosed cases of NSF associated with Omniscan is good news. RT: What is the ACR’s position on gadolinium-based contrast agents? Kanal: The ACR Guidance Document for Safe MR Practices last came out in 2007 and was updated online in July 2007. It is available at www.acr.org/mr_safety. In that rather extensive document—I think it’s 27 pages long in total—there are five or six pages dedicated just to this issue of NSF, renal disease patients, and gadolinium-based contrast agents. That document contains multiple recommendations as to what might be done to decrease the incidence of new cases of NSF from occurring. In this population, I personally favor performing a risk/benefit analysis and administering (when indicated in these patients) the least amount of gadolinium-based MR contrast material as possible in order to be able to reliably arrive at the diagnosis being investigated. RT: One of the safety recommendations in the ACR document is that only radiologists administer gadolinium-based agents. How would this help? Kanal: With the potential risks of the gadolinium-based agents sometimes not being that well understood by even radiology personnel in general, and certainly not by most referring physicians, it may not be appropriate for them to be writing orders to use these agents, especially in patients with significant renal disease. 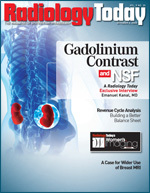 In the past, MR studies with gadolinium-based MR contrast agents had frequently been ordered specifically for patients with advanced renal disease because the referring physician or the radiologist may have been hesitant to administer an iodinated contrast agent for fear of inducing contrast-induced nephropathy in these patients. This, of course, predated our knowledge of the association between gadolinium-based MR contrast agents, renal disease, and NSF. Now we feel that those kinds of decisions need to be made by the radiologists. ... We feel that there is enough unknown to the referring physicians today about these gadolinium-based agents in renal disease patients that we do not believe referring physicians should be making the decisions as to how these agents are administered and to whom, at least not at this point. RT: Is NSF associated with the amount of gadolinium given, or is the effect cumulative? Kanal: There have been at least five publications in the past year or so of which I am aware that have brought to light the issue of cumulative dosing. It’s not just how much gadolinium a patient gets during a single examination, whether it is double or triple dose, that increases the risk of development of NSF. Recent publications suggest that total cumulative dosing of these agents in renal disease patients over months or years correlates with the incidence of acquiring NSF, and possibly with the severity of NSF if acquired, as well. Some authors have even suggested the idea of “lifetime” cumulative dose correlating with NSF risk. The higher the total dosage a patient gets over years, for example, the greater the incidence that that renally impaired patient may end up with NSF. Among the recommendations that we have incorporated into the ACR guidance document is that when the decision is made (based on the risk/benefit assessment for that patient) to administer a gadolinium-based MR contrast agent to a stage 3, 4, or 5 renal patient or one with acute kidney failure, the radiologist should use as small a dose as is needed to obtain the diagnosis that is being pursued. RT: Can you get as good a study with a smaller dose of contrast agent? Kanal: It depends on what one is pursuing and what one is diagnosing but, in many circumstances, absolutely. In fact, there are some higher relaxivity agents that are more recently available in the U.S. and abroad where while physically administering less of a gadolinium-based agent one can still produce an image that has the same amount of enhancement as would have been manifest had more of a lower relaxivity, older class of MR contrast agent been administered. This is the very basis of higher relaxivity, which may therefore play an important role in NSF prevention if the cumulative dosage hypothesis proves robust. RT: The FDA has included patients with moderate renal dysfunction in its alert. What evidence is there that suggests these patients are at risk, and is it reasonable to include them? Kanal: There may be almost no, or perhaps no, cases of confirmed NSF [in patients] who had been documented to have moderate chronic kidney disease before they were administered these gadolinium-based agents. For all practical purposes, this disease seems to be only seen in patients with either acute kidney injury or predominantly end stage (ie, stage 5) chronic kidney disease. The majority, but not all, are on dialysis at the time of administration. Still, from the little we know about cumulative dosing, it may be prudent to be conservative and to say that even for stages 3, 4, and 5 CKD, administer as low a dose as is needed to adequately achieve the diagnosis being pursued. In Pittsburgh, we are doing a prospective reporting as a quality assurance issue. We are recording any patient with stage 3, 4, or 5 chronic kidney disease to whom we believe the risk/benefit assessment warrants the administration of a gadolinium-based agent. We record the GFR, administer a low dose of MultiHance, and then we will be clinically, prospectively following them up to be sure they don’t develop any findings that might be worrisome for NSF. Subsequently, we plan on reporting this as a research arm of this activity. I’d like to reach 2,000 CKD patients to whom a gadolinium-based MR contrast agent was administered before reporting our findings, and we’re not too far from that number at this point. When we approach the size we are seeking, we will apply to the Institutional Review Board for approval to do a retrospective, anonymized study to see if any of these patients have been reported to have NSF or other abnormalities of which we should be aware. RT: You are chair of the ACR’s Committee on MR Safety, which published a guidance document in June 2007. Is the committee planning any further recommendations or advisories regarding contrast agents and NSF given the latest developments? Kanal: Most definitely. There was a joint meeting earlier this year between the American College of Radiology and the National Kidney Foundation. The sole agenda item was how to decrease the incidence of NSF. Hopefully, we will be seeing the recommendations from that meeting shortly.